Robert Wiene was born in 1881 in Breslau and died in 1938 in Paris. The son of an actor, he too studied Acting and later became a story editor at the Lessing Theater in Berlin. His first works were for Sascha-Film in Vienna and Bioscop and Messter Film in Berlin. 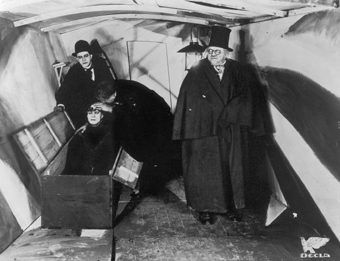 After cooperation on Satanas with Friedrich-Wilhelm Murnau, he directed Das Cabinet des Dr. Caligari, considered to be his most important film. His other films include: Genuine (1920), Raskolnikoff (1923), Orlacs Haende (1924), the passion play I.N.R.I. (1923), Ultimatum (1938), and many more.